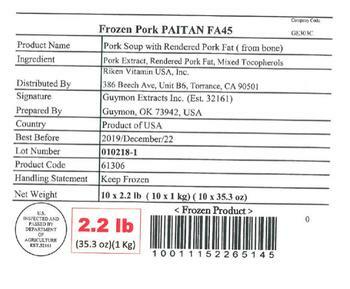 Guymon Extracts of Guymon, Okla., is recalling approximately 4,202 pounds of fully cooked pork soup. A processing deviation that may have allowed potential spore-forming pathogen growth including Clostridium botulinum and Clostridium perfringens. The recalled product, bearing establishment number “Est. 32161” inside the USDA mark of inspection, was sent to distribution centers and were further distributed in California, Colorado, Florida, Georgia, Illinois, Texas and Washington. Consumers with questions may contact Atsushi Fujimori at (580) 338-2624.